Interested in partnering with the North Vancouver Recreation and Culture Commission? Your business can choose from the wide variety of high-profile sponsorship opportunities listed below. Call Cathy Matheson, Manager Marketing & Administration at 604-983-6347 or email her for more information on these and other corporate partnership and sponsorship opportunities. 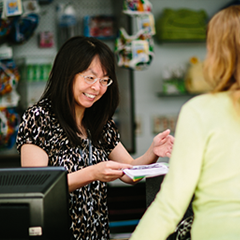 Our Playcard loyalty customer card and instant discount retail advertising program circulates 53,000 personalized cards in North Vancouver. Find out how to become a Playcard Advertiser. View our current Playcard advertisers. For more information contact Anne Rodgers at 604-983-6346 or by email. Centennial Theatre's exciting sponsorship opportunities include its popular A Play A Pie and A Pint series. For information on sponsorship opportunities, please contact Jill Johnson at 604-983-6455 or by email. Live & Local brings together North Vancouver’s most popular concert series (formerly the Friday Night Summer Concerts Series) and new arts events to deliver over 30 exciting cultural experiences for families, residents and visitors all summer long. This popular series of community concerts and arts events is held in five venues in North Vancouver (Edgemont Village, CIty Plaza-Lonsdale, Lynn Valley Village, Parkgate Village, and Deep Cove). For information on sponsorship opportunities, please contact Anne Rodgers at 604-983-6346 or by email.